Plants, algae, and other organisms produce the RuBisCO enzyme to convert carbon dioxide from the atmosphere into energy-rich molecules, like glucose, that form carbohydrates and other organic carbon compounds essential to life on earth. This catalytic process is called "carbon fixation." A better understanding of the specific activity involved when RuBisCO kick-starts this chemical reaction could be instrumental to enhancing the enzyme's efficiency and facilitating faster plant growth—a desirable result that could increase crop yields while conserving fertilizer and natural resources. To this end, researchers from Uppsala University are using neutrons at the Department of Energy's (DOE's) Oak Ridge National Laboratory (ORNL) to determine the protein structure of a RuBisCO sample obtained from spinach leaves. "We hope to comprehend carbon fixation in atomic-level detail, which would help us figure out exactly what is happening to each carbon dioxide molecule that the enzyme takes out of the atmosphere and brings into the biosphere," said principal investigator Marvin Seibert. During fixation, organisms "fix" carbon into place by binding it to organic molecules. Despite playing such a key role in this process, RuBisCO is exceptionally slow and inefficient. To compensate, plants are forced to devote a substantial portion of their valuable resources to producing large quantities of the enzyme. "A significant amount of the nitrogen that a plant needs for its growth goes into making RuBisCO, which in turn collects the carbon needed for photosynthesis," Seibert said. "Incidentally, a lot of the fertilizer we put in fields ends up in the inner proteins of plants to help contribute to this process." Because it is produced as a response to the constant demand for carbon, RuBisCO can arguably be categorized as one of the most abundant enzymes on the planet. Scientists estimate that, at some point, every carbon atom in every organism has passed through carbon fixation. If plants were able to thrive and complete carbon fixation under more efficient conditions, such a cost-saving, environmentally friendly outcome could contribute to overall improvements in the agricultural and economic value of important crops used for food, bio-fuels, and other practical purposes. Although scientists have used x-ray techniques to study RuBisCO in the past, neutron scattering methods have the distinct advantage of being sensitive to hydrogen. About half of the atoms in biomolecules are hydrogen atoms, which means the ability to pinpoint their location and structure is paramount to characterizing the enzyme's atomic structure. "If we can produce a neutron crystallography structure where we can see the hydrogen atoms in the RuBisCO active site, we should be able to investigate the enzyme's catalytic mechanism and learn more about the conversion of carbon dioxide to organic carbon compounds," Seibert said. 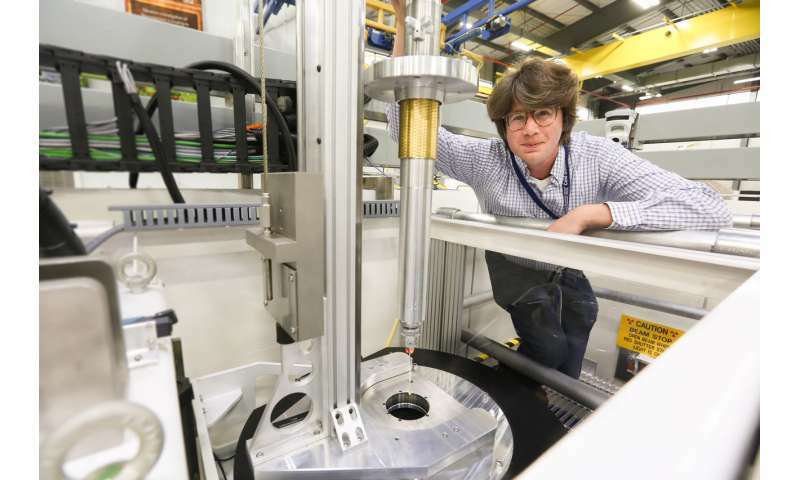 Working with ORNL scientist Flora Meilleur, the Swedish team is pursuing this goal at ORNL's High Flux Isotope Reactor (HFIR) using the IMAGINE instrument, HFIR beamline CG-4-D. They are also running complementary experiments at ORNL's Spallation Neutron Source (SNS) using the MaNDi instrument, SNS beamline 11B. Previously, the researchers relied on hypotheses and models to examine RuBisCO's catalytic activity, but they anticipate that the neutron scattering research will provide a more concrete foundation on which to build future studies. "We got results in the first five minutes, and seeing success that quickly is very unusual," Seibert said. "The combination of great instrumentation and wonderful people here makes this experiment possible."